So here I am again playing with Jolliest Time of the Year again. I was working on some items for this weeks Bloggers Challenge - "alter it", but decided I would share these today and work on something else for the challenge - so be sure to check back on Friday for my Altered Item. This stared out as a game piece from a rummy cube game. Don't worry I didn't use my kids game pieces, I actually had bought one just for altering purposes. I simply stamped and black embossed the image. Then colored it in using watercolor crayons (sharpie markers were too dark when embossed). Pressed my versamark pad to the colored image and clear embossed. When it cooled, I went around the edges with my Gold Krylon Pen. 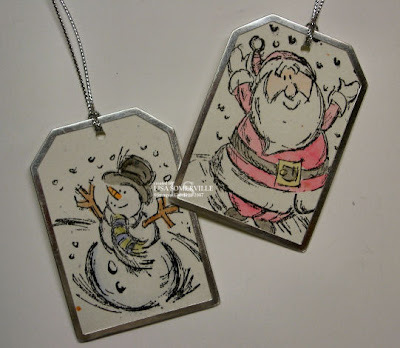 Next up, are some simple blank tags that I got from Innovative Stamp Creations - they are made by Making Memories. These are really easy to use - simply stamp your image then color. They provide you with a template so you can cut out your card stock to fit inside your tag. Pop it in the opening of your tag and press down to seal in the card stock. The new elastic cord in the Holiday Mini will work great with these gift tags! Last year I made some sparkly ornaments with Tags & More (shown here) using the Photo Holders at Oriental Trading....Well when the new catalog came out - Tags & More didn't make the cut. I was thrilled when Stefanie made these as her SSUS 3D swap at the Denver Convention, which is what made me purchase Jolliest Time of the Year. They're perfect to fit into last years left over photo holders, not to mention really quick to make. 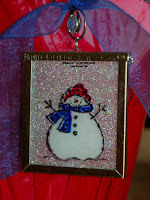 Simply stamp your image onto card stock and color, then apply versamark and iridescent ice embossing powder & heat. Cut to size, slip into your photo holder and your all set! Great projects, Lisa! Didn't take you long to get creative with your new stamp set!! Lisa, I love them all!! 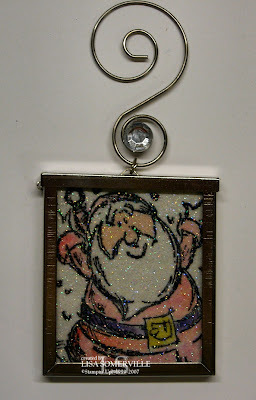 How smart to emboss the whole image with iridescent ice to avoid having to put glass in the frame! 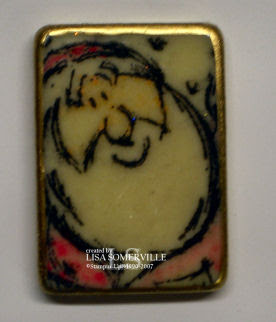 Lisa - just love these little guys - I had already planned to order this set as I thought it was so cute - but now - I'll have to add it as an ornament idea - thanks for the great ideas. Stinking cute, I got one in Denver too and now I have to start buying stuff to make them. Yahoo for creative friends!